We are a leading Exporter of keytruda (pembrolizumab injection) from Navi Mumbai, India. 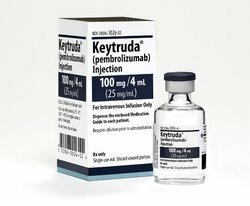 We are leading supplier of Keytruda (pembrolizumab injection).Pembrolizumab is a humanized antibody used in cancer immunotherapy. It is an IgG4 isotype antibody that blocks a protective mechanism of cancer cells and thereby allows the immune system to destroy them.